Now is your chance to become a world famous Olympic athlete. Click here to play! Compete for a chance to bring in the gold, silver, and bronze. Start off your bid for gold by taking to the baseball diamond. Spin in two or more of the baseball symbols and you’ll take in a payout worth up to 500 times your line bet. Next, you’ll be hitting the ice. Two or more hockey symbols will get a payout worth up to 350 times your line bet. You’ll also be hitting the gridiron for a game of football. This symbol has a top payout worth up to 300 times your line bet. Other events include soccer, basketball, tennis, golf, and boxing. Compete in any one of them and you’ll take in some pretty handsome payouts. There are also such classic Olympian symbols as the bronze trophy and the iconic torch. As any Olympic athlete knowns, the hardware is the ultimate payoff. This is certainly the truth when it comes to this game. The gold medal is a wild and will substitute for other symbols to help you bring in wins. The silver trophy is a scatter and will trigger a number of free spins if you can spin four or more anywhere on the board. Finally, the gold trophy is a bonus symbol that will trigger a second screen bonus game for even more chances to win! The silver trophy is a scatter. Spin four or more anywhere on the reels to trigger up to 30 free spins. The gold medal is a wild symbol. 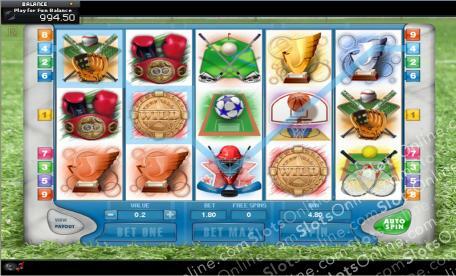 It will replace most others (excludes scatter and bonus symbols) to help you create more winning lines. Spin three or more gold trophies across an active payline to trigger a fishing bonus game. You'll have to choose where and what you want to fish with to win bonus prizes. Watchout though because there are some booby symbols in there that will end your game.